The GLOA, through support of its members and others, supports two charitable funds, the Ron Mallonee Fund and the Kevin Moore Fund. The Mallonee Fund enables high school players who best exemplify Ron’s spirit to attend lacrosse summer camp. The Moore Fund provides financial assistance to officials who want to attend professional development opportunities. If you are interested in making a donation to either of these funds, please contact president@galaxref.com. Ron Mallonee passed away on May 26, 2004. Ron was a charter member of the GLOA and was a veteran official who had given to the game of lacrosse as an official at the club, college, high school, and youth levels. Ron worked diligently to train new officials. He had also served as the de facto commissioner for the local club league. His presence was welcomed on the field by coaches, officials, and players due to outgoing nature, enthusiasm, and friendly demeanor. All who knew him will miss him. Please keep him in your thoughts and prayers. The GLOA has established a scholarship fund in Ron’s memory and we are accepting donations for this effort. The fund will be directed to assist players who best exemplify Ron’s selfless attitude towards the game of lacrosse. Since the Ron Mallonee Fund’s inception in 2005, GLOA has been able to provide scholarships to over forty deserving boys from the state of Georgia to attend lacrosse camp or play in out of state lacrosse events. RONALD D. MALLONEE Age 50, of Smyrna, Georgia, passed away on Wednesday, May 26, 2004, at St. Joseph’s Hospital in Atlanta, Georgia, of cancer. Ron was a 1971 graduate of Andrean High School and attended St. Thomas More College in St. Paul, Minnesota. He was a master carpenter and the owner of Professional Deck Care in Smyrna. He is survived by his mother and father, Ben and Laura Mallonee of Ogden Dunes, Indiana; sisters, Karen Kirby of San Francisco, California, Maria (Mike) Funicello of Mesa, Arizona; brothers, John (JoAnne) Mallonee and Steve (Maria) Mallonee of St. Louis, Missouri, Mike (Beth) Mallonee of Martinez, California. Ron was a loving uncle to four nephews and two nieces, Sean, Matt, Aaron, Andrew, Kathleen and Tia, all of St. Louis, Missouri; dear friend, Teresa Farmer of Smyrna, GA and many loving aunts, uncles, and cousins. Ron’s passionate interest in the sport of lacrosse led him to an active role as an accredited referee for NCAA college lacrosse and to participate as a referee and a league administrator in youth sports leagues, high schools and the men’s club lacrosse teams in the Atlanta area. A powerful and lively presence in our lives, he will be sadly missed and comfort is found in knowing he has positively influenced family and friends, and the sport of lacrosse in the Southeast. A Mass of Christian Burial will be celebrated Saturday, May 29, 2004, 10:00 a.m. at St. Mark Church, Gary, Indiana. Mr. Mallonee will lie in state from 9:30 to 10:00 a.m. at the church. Friends are invited to meet with the family on Friday from 2:00 to 8:00 p.m. at the Burns Funeral Home, Merrillville/Crown Point Chapel (corner of 101st & Broadway, Crown Point, Ind.) Prayer services will be offered Friday at 7:30 p.m. A memorial service will also be held in the Atlanta area with details to be announced at a later date. Kevin Moore passed away on October 21, 2006. Kevin was a charter member of the GLOA and was a veteran official who had given to the game of lacrosse as an official at the club, college, high school, and youth levels. Kevin was a highly respected member of the lacrosse community in Georgia. During his time with the association, Kevin Moore worked diligently with new officials. In his memory, GLOA created the Kevin Moore Fund to help provide financial assistance to referees who are willing to travel to out of state events to gain additional experience and improve their officiating. The Kevin Moore Fund also helps support lacrosse referees in financial need to due to severe medical expenses. 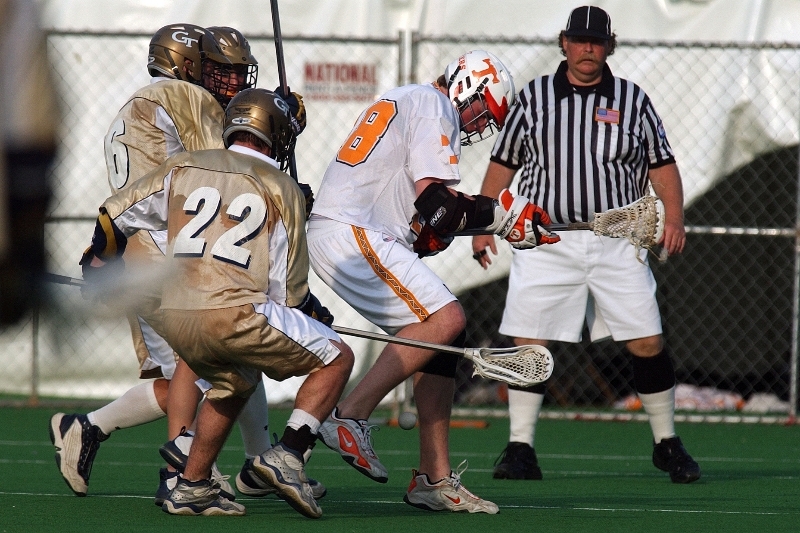 Since the Kevin Moore Fund’s inception in 2007, GLOA has been able to support Georgia lacrosse referees attending lacrosse camps and tournaments around the United States (Colorado, North Carolina, Massachusetts) and around the World (Finland, England). I wanted to let you know that I am deeply saddened by the news about Kevin. He was one of the good guys and will be missed by me and many other people in the Atlanta area. I knew Kevin for about 8 years and in that time we became pretty good friends. He was generous by nature and last year he demonstrated this in his typical low key manner. When I saw him in the spring he had a very nice long sleeve referee’s shirt. I inquired as to where he purchased it and he told me he would get me one. Well he got me two and refused to accept any money for the shirts. This was very typical of Kevin. He was always available to help out with games and to do whatever needed to be done to help out the game of lacrosse. He was always thoughtful, helpful and generous with his time when it came to training new guys or with refereeing youth games, or any game for that matter. I am not sure you know much about his refereeing exploits but he once did a game while having an IV in his arm! He also was well thought of as an official. On three separate occasions he was selected to referee in the GHSA state championship game. When our mutual friend Ron Mallonee passed away suddenly a few years ago it was Kevin who had the idea to memorialize Ron’s name with a camp scholarship for kids attending summer camp. Without a doubt we will be doing something similar for Kevin. I am certain that I speak for all of his fellow referees in the Georgia Lacrosse Officials Association in saying that we will miss him tremendously. Our thoughts and prayers are with you and your family.